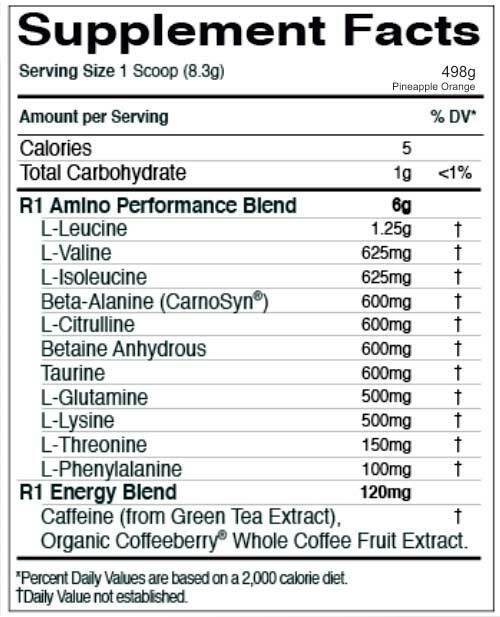 Mix 1 scoop of R1 Pre Amino in 6 to 8 oz i.e. 177 to 237 ml cold water. Have in sips during workout. You can use it in morning on wake up, pre-/intra-workout power, or mid-afternoon to help get you through the work day. Q.1 IS R1 PRE-AMINO AN AMINO ACID OR A PRE-WORKOUT? Q.2 WHEN DO I USE R1 PRE-AMINO? You can use R1 PRE Amino anytime except evenings when the natural source caffeine might interfere with sleep. Some suggested usage: morning wake up, pre-/intra-workout power, or mid-afternoon to help get you through the work day. Q.3 CAN I USE R1 PRE-AMINO WITH A PRE-WORKOUT? A two scoop dose doubles the aminos and brings the energy levels on par with many pre-workouts. No need to take a Preworkout if taking 2 scoops of R1 Pre Amino. Q.4 HOW IS R1 PRE-AMINO DIFFERENT FROM OTHER SPORTS DRINK FORMULAS? Traditional sports drink formula consists of electrolytes added to simple sugar solution to help maintain fluid balance. R1 PRE AMINO is a unique sports drink/BCAA formula containing ingredients that promote fluid balance along with essential amino acids like BCAA and Caffeine to provide energy during training as well as support recovery post- training. R1 PRE AMINO is a zero sugar formula that can serve as an alternative to traditional sports drinks. Q.5 ARE THERE ANY SIDE-EFFECTS OF R1 PRE-AMINO? No. It is a simple sports drink recovery formula with essential amino acids. However, individuals with Hypertension or heart related conditions should avoid as it contains caffeine. Do check other ingredients mentioned on the label to rule out any ingredient which you may be allergic to.